Change can be a difficult process. London is currently in a transition with our homelessness programs to move more resources from managing people while they are homeless, to prevention or rapid re-housing with supports. This is difficult as it means the typical modes are altered, impacting funding, employment, and processes within the sector. For example, part of the vision is to reduce the utilization of emergency shelters by providing people more permanent housing alternatives. This has direct implications for the wonderful organizations who have been providing emergency shelter for years. 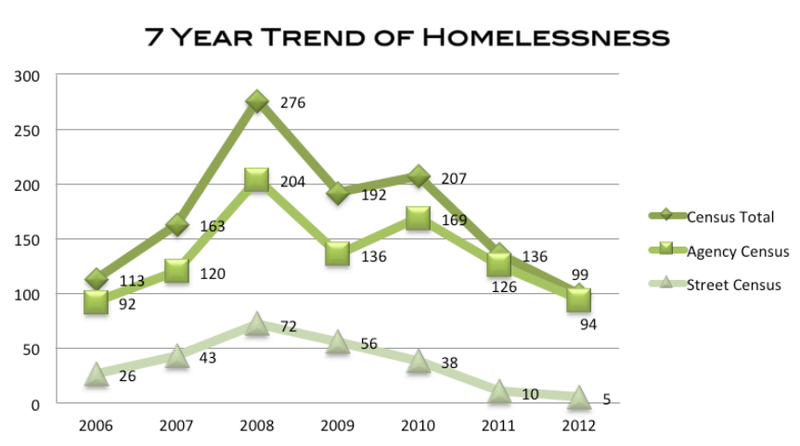 By moving people into housing, they have greatly decreased emergency shelter use. This, along with increased outreach support, has decreased rough sleeping to almost nil. Extrapolating the curve suggests that by the end of their next 5 year plan, homelessness in Lethbridge will be minimal, hopefully only representing a transition phase as people move into housing. Now, it’s not all positive. 623 individuals and families continue to wait on the Lethbridge list for affordable housing. However, even this large wait list is not translating directly into people stuck in shelter (see chart on page 41). What we in London can learn though is doing this hard work to reorient the system has been shown to have positive results. A man stands at the curb in front of your house. His beard is too long; his skin is too tanned, starting to wrinkle like a crumpled piece of paper; his hands look sticky from beer spilled from crushed cans; his nails are black. 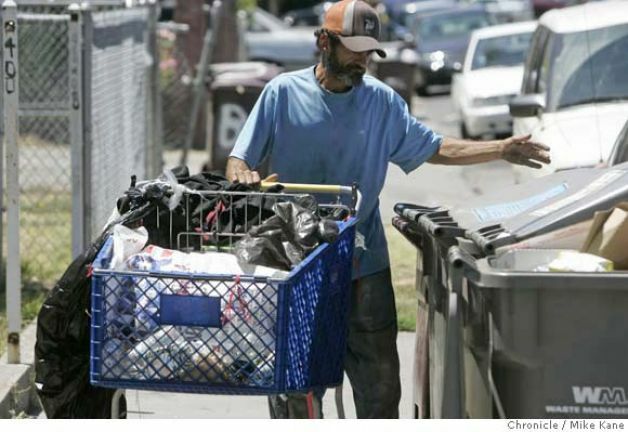 The man bends down and digs through your recycling bin, retrieving a wine bottle and adding it to the precarious pile growing in his shopping cart. Passing dog-walkers are careful not to look at him. Passing motorists show frustration that his cart is on the road. What separates you from the man at the curb? Is it a series of poor life decisions, or a series of unfortunate events? What if you had been abused as a child, and hadn’t dealt with those demons? What if you were genetically inclined to alcohol addiction? What if you had your leg crushed in a car accident? What if your job was downsized? What if your Employment Insurance ran out? What if you yelled at your spouse and they left with the kids? What if your depression went unmanaged and you couldn’t escape the dark place? What if your home was foreclosed, your car was impounded, your family became ashamed of you? The man at the curb is just like me, but not as lucky. Good information can be very helpful in terms of addressing health and social problems. The federal government provides an optional information system to be used by shelters called HIFIS (London is in the process of adopting it). By having a common information system used across many municipalities, there is an opportunity to note particular trends. 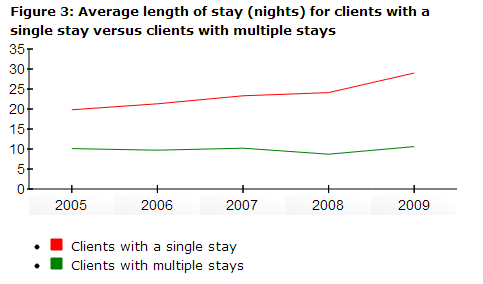 The National Shelter Study does just this, looking at trends in shelter usage from 2005-2009. What we note here is that although the majority of individuals still continue to have only one stay in shelter over any given year, they are staying in shelter longer. This is very consistent with our concerns that there are limited affordable housing options to help move people out of shelter. Previous research shows that 0% of people who are homeless would choose homelessness as their ideal housing status (C. Forchuk), therefore these individuals are staying in shelter for lack of housing. As I have discussed previously, shelter is a much more expensive option administratively than moving people into affordable housing. These stats show how we need to continue to put pressure on federal, provincial, and municipal governments to expedite new affordable housing (with supports).